If you collect a specific player or team, you've probably got boxes or binders filled with cards. You might even have a few McFarlane figures, Starting Lineups or high-end statues lining your shelves. Often, one of the most enjoyable parts of the hobby is finding a unique treasure. Topps player contracts are relatively affordable pieces of memorabilia that are a direct link to cards. Top players and vintage contracts can get pricey, but most are reasonable. Shop for Topps player contracts on eBay. While most card companies deal with player unions to gain access to players, for baseball, Topps does individual deals with players. That's part of the reason why some players don't appear in Topps products. Topps player contracts are expired. They outline the licensing rights the card maker gains from the deal. It's also interesting to see how much (or how little) that can make from such deals. Although they change from year to year, these contracts are largely generic documents that have several fill-in-the-blank spots. Besides the history behind the deal and the cards they came from it, Topps player contracts come signed by the player. Topps sells expired contracts publicly through two venues, eBay and the Topps website. Once they're out of Topps' hands, many can also be found on the secondary market offered by other seller. Common Topps player contracts can sell for as low as $10. Hobby legends can go for thousands. Typically, most deals run three years. This means lots of players have multiple contracts. Like cards, the first contracts often command a premium. Because newer contracts are either still being used or need to be held onto for a number of years, you're likely to find players from 2005 and earlier. Standard deals signed as late as 2005 show Topps paid active players $75 per year to use them on cards. These rates can vary for special deals. 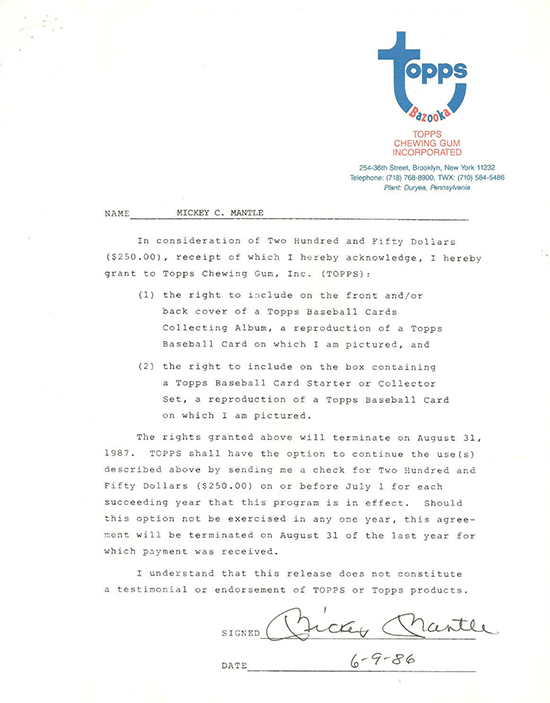 For example, here's a 1986 Mickey Mantle contract that paid the Yankees great $250 per year to use him on reprints, album covers and in special sets. Not all of these contracts have been sold since the Topps Vault eBay store was launched a few years ago. 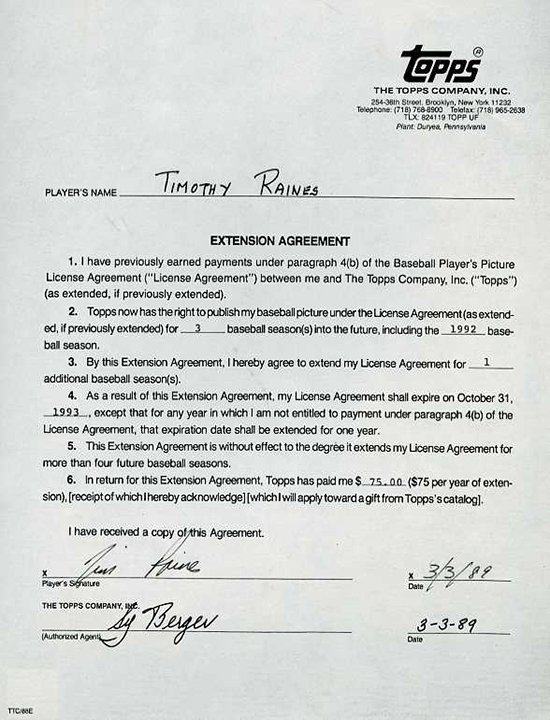 Some of the bigger contracts on the secondary market were auctioned off by Topps in 1989. In addition to basic player contracts, collectors can be on the lookout for some variations. Some early autograph sheets have become available. These have several boxes for the players to sign inside that would be used to incorporated facsimile signatures into card designs. 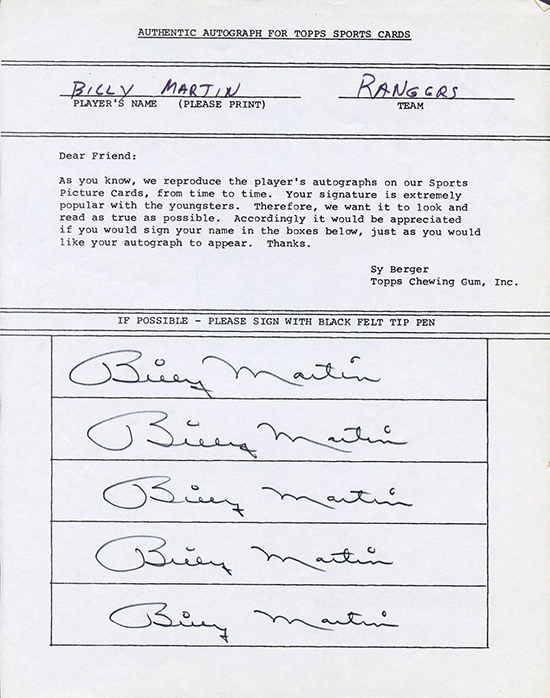 Typically, vintage autograph sheets have several autographs from the same player on them. 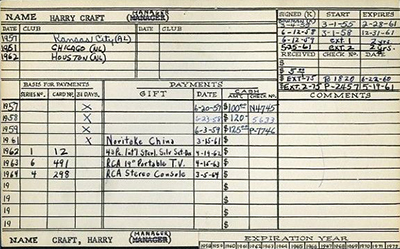 Player file cards show a more primitive way of record keeping. These list the various contracts and the payments or gifts that were used in lieu of cash. Players could get gifts of things like TVs, stereos and even fine china. Besides offering a unique piece for a personal collection, Topps player contracts pack a lot of hobby history into them as well. Aren't those stories what make collecting even more interesting? Interesting article. I never knew contracts were signed this way. Thanks Ryan!